BERKELEY, California, February 26, 2015 (ENS) – Ticks bearing the bacterium that causes Lyme disease are populating Northern California’s birds that then fly them into suburban areas, finds new research from the University of California, Berkeley. Lyme disease is spread to humans through the bite of infected ticks. The black-legged deer tick, Ixodes scapularis, transmits the bacterium B. burgdorferi in the eastern and north-central regions of the United States, while the western black-legged tick, Ixodes pacificus, spreads the bacteria in the West. Ticks usually infest animals such as white-footed mice, voles, other small rodents and deer. The UC Berkeley study reveals birds as an important newly-found reservoir in the western United States for the corkscrew-shaped bacterium. “The role of birds in the maintenance of Lyme disease bacteria in California is poorly understood,” said the study’s lead author Erica Newman, a UC Berkeley PhD student in the Department of Environmental Science, Policy and Management. “This is the most extensive study of the role of birds in Lyme disease ecology in the western United States, and the first to consider the diversity of bird species, their behaviors and their habitats in identifying which birds are truly the most important as carriers,” Newman said. The birds in the study found to host the Lyme disease bacteria, such as American robins, dark-eyed juncos and golden-crowned sparrows, are species often found in the suburbs. Lyme disease spirochetes (say spy-ro-keets) were detected in 57 of the 100 birds in the study that carried ticks. Among the ticks themselves, 13 percent of the larvae and nearly 25 percent of the nymphs were infected with B. burgdorferi or related spirochetes. Among the 23 species of birds that were infected, the study authors highlighted the lesser goldfinch, oak titmouse and dark-eyed junco as birds that harbored more subtypes of Lyme disease bacteria than others. 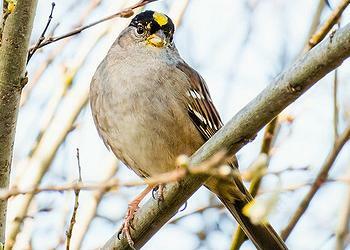 The golden-crowned sparrow was infected more frequently than other species. One of the most surprising results of this study is that “another species of Lyme disease spirochete closely related to, but distinct from, Borrelia burgdorferi was detected in birds for the first time anywhere in the world,” said study co-author Robert Lane, a medical entomologist and UC Berkeley Professor of the Graduate School, and a leading expert on ticks and Lyme disease. That spirochete, named Borrelia bissettii, has been known to cause a Lyme disease-like illness in people in central and southern Europe. This bacterium was the most common of the Borrelia species found in birds. Tick-infested birds were found in all types of habitat studied, but the researchers found that chaparral correlated with the lowest counts of larvae and nymphs on birds among the ecosystems studies. “Other studies have shown that there are plenty of ticks in chaparral, but that was not translating to transmission of Lyme disease bacteria in birds,” said Newman. “This is important because part of the fire management strategy in this state is to remove fire-prone chaparral,” she said. “What this means for birds is that many species that only live in chaparral are then replaced by species from other habitats, some of which we also now know are more important carriers of Lyme disease bacteria. “Our study suggests that by removing chaparral, we may be increasing the spread of Lyme disease in California,” said Newman. Another study published this week shows that changing climate patterns are changing the life cycles of ticks in a way that spurs transmission of the bacterium that causes Lyme disease in animals and humans. A team of scientists led by Taal Levi of Oregon State University and Richard Ostfeld of the Cary Institute of Ecosystem Studies analyzed 19 years of data on blacklegged ticks in the U.S. Northeast and their relationship to host animals. They overlaid the results with climate data and used computer models to predict what may happen in the future. “The bottom line is that as the climate warms, it is pushing the timing of tick nymphs and larvae forward, potentially changing the interactions they have with their hosts,” said the study’s lead author Levi, an assistant professor in OSU’s Department of Fisheries and Wildlife in the College of Agricultural Sciences. After adult ticks lay eggs in the spring, the larvae emerge in the summer. In August and September they begin looking for a host to feed on. The tick larvae are not born infected, but become infected after feeding upon an infected host. As they transform to nymphs, they normally become active the following spring. It is the nymph stage of ticks that is most dangerous for humans. Ticks can attach to any part of the human body but are often found in hard-to-see areas such as the groin, armpits, and scalp. The tick must be attached for at least 36 hours or more before the Lyme disease bacterium can be transmitted and Levi says most people will spot and remove the tick within that time. Named after the towns of Lyme and Old Lyme, Connecticut, where cases were first identified in 1975, Lyme disease was determined to be a tick-borne disease in 1978. The Centers for Disease Control and Prevention says Lyme disease is the most commonly reported tick-borne illness in the United States. There are about 30,000 cases reported each year, most in the eastern United States. Actual cases are often underreported to the CDC, so the agency notes that the number of people diagnosed with the disease each year may be 10 times higher. Early symptoms may include fever, headache, fatigue and a rash. In most cases, the infection and its symptoms are eliminated by antibiotics, especially if the illness is treated early. Left untreated, later symptoms may involve the joints, heart, and central nervous system, symptoms that can be disabling and difficult to treat. * – Wear light colored long pants and long-sleeved shirts when spending time outdoors. Tuck pant legs into boots or socks and tuck shirts into pants. * – Apply repellents registered for use against ticks and stay on trails when hiking. * – Conduct a tick-check over your entire body, including the hairline, armpits, back of knees and groin, after outdoor activities, including picnicking. 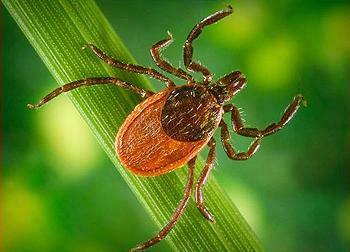 * – Continue to watch for ticks for up to three days, after returning from tick habitat. 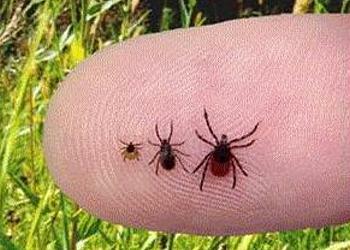 * – Parents should check their children thoroughly for ticks.